*We went to see Captain America on Friday and got there probably 20 minutes before the movie started. They were playing all sorts of commericals including a nearly 5 minute long “commercial” for some Lifetime show. That Talk Dirty to Me song was…well it wasn’t even playing in the background, about half of the commerical was women walking around and the other half was whatever** dude*** sings the song with some scantily clad women twirling around him. “Is this a music video?” I asked Keith, amazed that they now played music videos before movies. “How should I know?” he retorted; which…good point. It wasn’t until nearly the end that they flashed the name of the show and I realized that it was the most bizarre commerical ever. They played a shorter version at least twice more before the movie started and I have since been unable to get the song (or really just the snippet I know) out of my head. Anyways….last week I had a paper due for my dirt class. We were given the latitude and longitude of a piece of land and had to write up a survey of it, talking about the soils and landforms and whatnot. My professors provided us with a lot of links for information since we couldn’t just up and travel to this plot of land. The coolest**** link we were shown was for Penn Pilot. It is a database of hisotric aerial photography for the entire state of Pennsylvania. Two days before the paper was due, instead of pulling it up and typing in my homework assignment, I immediately typed in my home address. They have 3 eras of photography, 1937-1942, 1957-1962, and 1967-1972. So you type in an address or a city and all the little red dots show where photos were taken. For each era they are slightly different, but luckily I live close enough to an intersection of two major roads that I was able to locate my house pretty easily. In 1939, my home did not yet exist. It would later be built where the blue arrow is, right on the edge of a field. 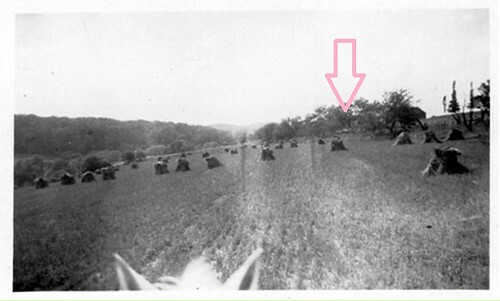 The pink arrow points to the original farmhouse, which is still there! And for sale! Someone buy it so I can go look inside! In 1956, my house was 6 years old! Just a baby! Out in the middle of a field. I wish there was google street view back then, I’d love to see what it looked like up close. And now, 2014, my house is 67! She can retire! She now has lots of neighbors but the most amazing part (to me) is the amount of treeeees! There were some in the tip of the triangle back in ’39 but the majority of them were not even there in 1967. I really would love to know what it looked like without any trees. I would say more than half of our property is covered in trees and while I like that (more privacy, less grass to cut) it would have been cool to see the whole ~3 acres bare. Pretty awesome to see the evolution of the neighborhood and our property. Can I get a job doing this? Just looking at old houses and maps all day? And adding little arrows in Paint? Please? **Yes I am 83 years old, living under a rock. Proud of it, too. ***I just looked it up and apparently it’s Jason Derulo and I have heard that name before but I thought he was a country singer. See above asterisks. ****If you are a super nerd like me. Disclaimer: I am a super nerd. So we live on a road I’ll call Petunia* Road. Back in the day, when our township was just starting out and everything was farmland, the Petunias lived here and the road was named after them. At some point, another farm either came to be or replaced the Petunia farm (I can’t find enough information) and that was the Lilac* Farm. The Lilac family are who we bought our home from. So I scrolled through hundreds and hundreds of pictures dating from the late 1800s and was able to find a bunch of pictures featuring the Lilac family. The previous owner of our house (Bob) told us that until the age of 6, he lived on Petunia Road with his grandparents. His father then came back from the war and built our house in 1950. It cost him ~15,000$ in materials. At that point, there were only 3 homes on the road, two original farmhouses and ours. All inhabited by the same family. 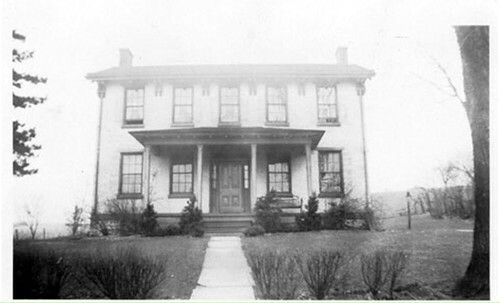 One of the original farmhouses that still stands and is still occupied by a Lilac (Bob’s Aunt). The other was torn down sometime in the past few years. I was really hoping to find a picture of our house shortly after it was built, but most of the photos are older than that. 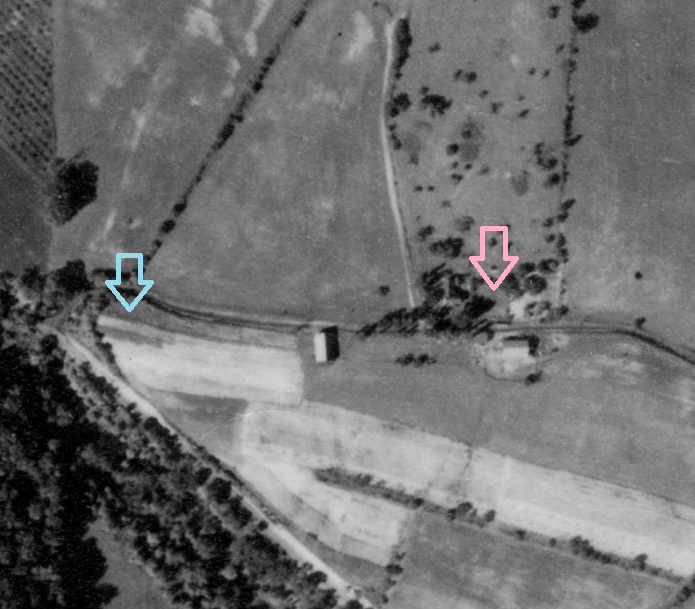 I did find this picture that shows the location of our house in 1930. The arrow is about where our house is, we are actually probably 3 lots farther back. The whole field was turned into a housing plan ~1970 so it’s pretty crazy to see just farmland. I think it’s awesome to see these pictures and see the other pictures of the family (if not the person) who built our home. This is exactly what I wanted when we were looking for a house, a place with history. They even left us the original blueprints, which I thought was really cool, though they are pretty fragile.